Alex Hall was a much loved & respected resident of Bexhill on Sea, East Sussex. He was a native Londoner who moved to Bexhill permanently in 2004. He became a very active member of the Bexhill Runners (now Bexhill Runners & Triathletes) & ran many events in club colours (both home & abroad). A qualified electrician who had built a successful contracting company in Buckinghamshire, he delighted in a very different career as a seasonal Coastal Officer for Rother District Council, working on Bexhill Seafront from March to September for 4 seasons. 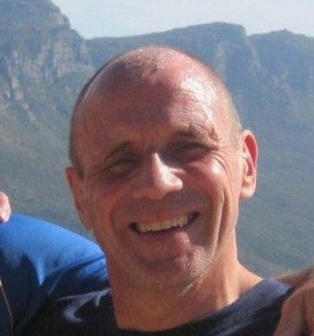 Alex tragically died of a heart attack on February 27th 2012 on Bexhill Seafront, whilst out running with a fellow club member. His death shocked, saddened & affected the whole of the Bexhill community, especially his fellow BRT members and his colleagues at the Coastal Office/Rother District Council. Alex was renowned in the Bexhill community for his cheery demeanour, his willingness to help others & his desire to always make the seafront a safe & enjoyable place to be for all. Local people & tourists loved his famous sense of humour, his ever energetic wave & his notorious (always exposed even on a freezing March day) sun tanned legs. His role within Bexhill Runners/BRT was one of an unofficial, voluntary extra coach, always encouraging & cajoling other members, especially the younger and the more senior members. Alex himself was an excellent runner but would always dedicate his time to others at training sessions & events, sometimes at the sacrifice of his own training regime/targets. Bexhill Runners/BRT were almost a second family to Alex. The Alex Hall Memorial Fund has been set up by his wife Lorraine, children Alexander & Victoria and friends & fellow BRT members. The family’s express wish is that any money raised for the fund (initially from donations made at Alex’s funeral) aims to help & encourage people, especially young people, into sport, with the onus on working closely with BRT. We are looking to try to support sports in local schools & hopefully encourage kids (and their parents) into sport via the club. It is ideal that AHMF & BRT are close partners. BRT have shown huge support already & have dedicated an annual Alex Hall Memorial 5k, held in February . We have also had great support from Rother District Council & local business, retailers & organisations. The AHMF is looking to donate prizes to BRT events. The Fund is also looking to raise money to purchase a defibrillator for Bexhill Seafront, located at the Coastal Office –supported by BRT, the Coastal Office, Rother District Council & the De La Warr Pavilion. We are looking to organise more fundraising events. We aim to have a dedicated website in the near future. We thank all of you for your love & support so far and in the future. Please follow our progress and remember dear Alex who lived life to the full and enriched the lives of those who knew him. The Alex Hall Memorial Fund was set up in memory of a much loved club member. The fund is to enable children, regardless of their ability, to be able to take part in sport.